GUIDE DOGS: These dogs are meant to be the eyes of their handler. They guide them through day to day movement and are responsible for getting their handler from one place to another free from harm. PSYCHIATRIC SERVICE DOGS: The main job for this service dog is to break the cycles of trauma. They work with handlers that suffer from PTSD (Post Traumatic Stress Disorder), and other psychiatric disabilities. The service dogs’ duty is to monitor the handler, interrupt panic attacks, get medicine and get help. 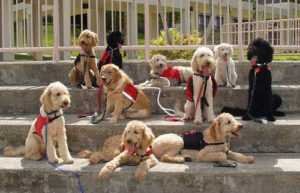 MEDICAL ALERT DOGS: This is truly amazing! These service dogs are trained to notice the symptoms that their handler has leading up to a medical condition like seizures or blood sugar changes. MOBILITY ASSISTANCE DOGS: These service dogs are used primarily for stability purposes when their handler is walking. These service dogs also retrieve dropped items and guide their handler in day to day activities. 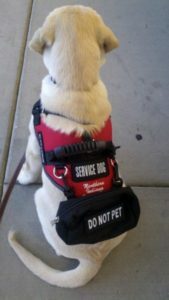 All of the jobs that service dogs are trained to do are serious. These dogs hold the life of their handlers in their paws and cannot afford to be distracted by other humans.